Just about everything about mobile is spontaneous and immediate, except for one thing – the strategy. In fact, mobile marketing is not about improvising an idea and testing it out sporadically. Creating a good mobile strategy means expanding horizons, time and tools in order to achieve significant results. A series of actions must be studied and coordinated with each other and with the overall marketing plan of the brand. You must also put yourself in the shoes of your target: what do they search for on mobile, how can they find your brand, what can convince them to convert their interest into action? In addition, you have to set clear goals for your strategy: convert leads, build awareness, and create engagement. 45% of marketers already have a strategy, do you? 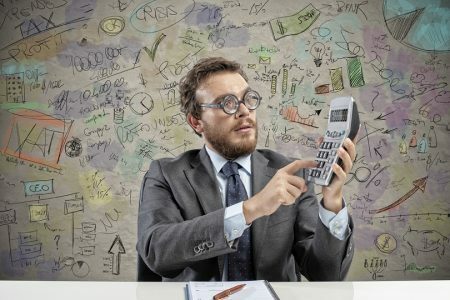 Do you think it is hard to implement a mobile strategy? Note that while you are thinking about this, 62% of the brands have increased their investment for this type of device in the past year, while 45% of marketers are working on a defined mobile strategy. And at least one of your competitors is among them. That is why you must get to work and to help you get started, we’ll give you practical ideas. Here are 5 brands that have already implemented a successful mobile strategy. Vegas.com sells travel packages and tickets to the main shows taking place in Las Vegas. 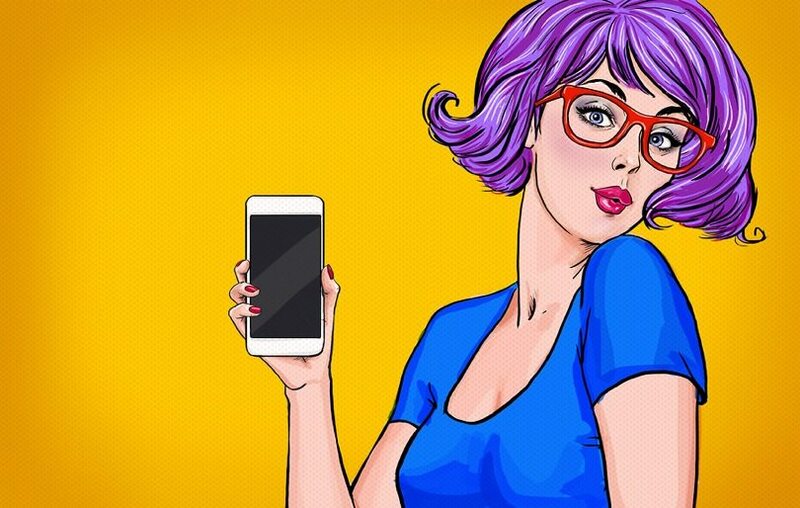 Until recently, its website mobile performance was disastrous: visitors who hit the site on their smartphones were likely to abandon it after viewing only one page. In fact, analytics data showed that mobile bounce rate was 50% higher than that of desktop and even conversions were significantly lower. This data was alarming, considering that mobile visits were growing year after year. So the Vegas.com team decided to improve the browsing experience on mobile devices, with the goal to encourage the visitors to stay longer on their site and increase sales. Thus a mobile version of some parts of the site was created: home, category pages and hotel room search tool. To improve mobile experience, content was simplified, with direct links to the most popular categories of the site. At this early stage, they decided to redesign only a few pages and test them. Half of all mobile visitors were sent to the traditional homepage and the other half to the optimized site. After two months of testing, the redesigned pages for mobile resulted in 22% lower bounce rate, 16% more page views and 4% higher conversion rate. The Vegas.com team then extended mobile optimization to their entire site architecture. This test experience for mobile was necessary for a targeted strategy to improve user experience, starting from the website. When optimizing a mobile site, take into account the statistics: do it before intervening, to understand which ones are the most critical, and after creating the new optimized pages, to assess whether you intervened in the right way. Proceed step by step and test before implementing. Make good use of the results that are being monitored. Understanding user behavior is useful to determine the next steps of your mobile strategy. The goal of Virgin Media was to make its TV packages related to football games more widely known. After analyzing the target (football fans aged between 18 and 35 years old), a campaign on mobile was identified as the best strategy. The campaign was planned for three weekends during the Premier League on the mobile site of The Guardian. 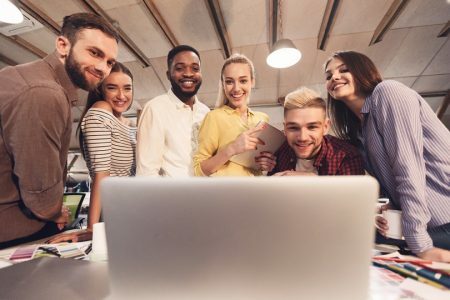 Their idea was to capture the attention of the target audience during the football event, inviting them to click on an ad related to it, through two call-to-actions. One asked them to check out for more Virgin products, while the other offered an option to download the calendar for Premier League matches, which would automatically sync with the users’ phone. During the season of the campaign, 100,000 new subscriptions were registered, of which 52,000 were to the sports channel. The hundreds of downloads of the calendar of the Premier League, showed that people would willingly interact with mobile campaigns when they are offered relevant content. It is the moment that matters when it comes to mobile. 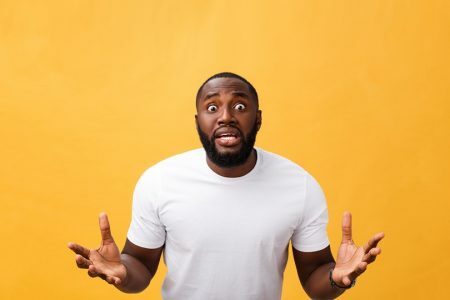 Capturing users attention during an event they are interested in and involving them (whether it is a national holiday or their birthday) significantly influence the results of a campaign. Therefore, it is important to plan your mobile strategy taking into account the right time to communicate to your target. ASDA, a British chain of supermarkets, wanted to simplify the purchase process of its products by promoting itself as a brand providing customer-oriented services. To do so, it created a free app that allows users to shop more quickly and conveniently. Among many features, the customer can choose the products that interest them on the app, scan the barcode of the various items to add them to a shopping cart, and see the nearest ASDA supermarkets on the map. But what counts even more is the fact that the app offers a broader user experience. It offers not only purchasing services, but also useful information in daily life, from recipes to real time updates on the price of gasoline. 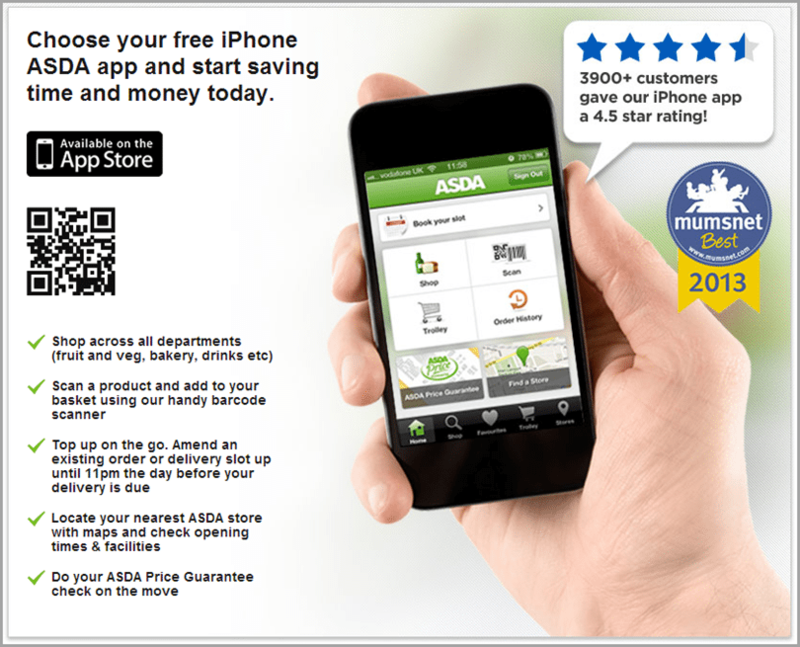 The app created by ASDA has been downloaded 2 million times. Mobile purchases accounts for 18% of all online orders with a shopping frequency that is 1.8 times higher than desktop. Think about your customers’ needs, how can you simplify the purchase process of your product and offer more to them? Mobile provides more opportunities for interaction and involvement than physical stores or desktop e-commerce. Keep this in mind for your mobile strategy and make the best of it. The restaurant chain zpizza had a goal to achieve 100 high-spending clients (those who spend at least $50 per month) for each of its shops. How to identify this target? The first step to be taken in this case is to create a database of registered users for your newsletter and loyalty programs. So zpizza ran a data collection campaign by integrating web and offline means, email and SMS. 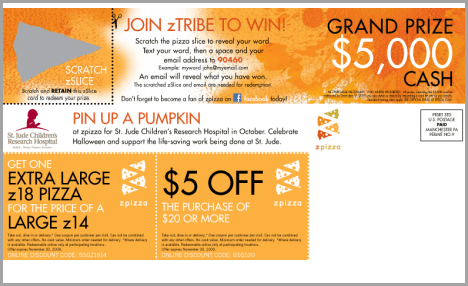 Promotional postcards were made and sent to the residents within 2 miles of each local zpizza restaurant. The postcards contained a code for users to send via SMS along with their email address for a chance to win $5,000 or other prizes. Participants would then receive a reply to the email address they provided. The campaign was also announced on the website and on the brand’s social channels. With the data provided voluntarily by customers, zpizza achieved two goals: to enrich its mobile database with new contacts for future campaigns, to get registrations to loyalty programs, which increased by 5% during the 6-month campaign, as well as to identify the high-spending target. Integrate your mobile strategy with traditional marketing tools, they are useful for involving people from several fronts, offline and online. If you use SMS, also consider tracking the users’ geographical location, you can use this data for future geolocalized campaigns which are highly effective on mobile. Mobile strategies have long been part of the marketing strategy for the American beer Bud Light. In 2010, it ran a campaign promoting a continuous 5-day party at the Hard Rock Hotel in Las Vegas. The brand invited participants to register for the event’s mobile program, to receive updates, prizes and special offers during the days of the party. The result? 57% of participants at the event signed up and interacted with the brand’s communications. Recently, it launched a new interesting mobile campaign using Tinder’s native videos. This app was chosen because its main target is Millenials, which coincides with that of Bud Light. Users were invited to send a video to show their enthusiasm to participate in future events sponsored by the brand. The participants had a chance to spend a weekend partying in an unknown location. Bud Light’s video that promoted the campaign was displayed in the native flow and redirected Tinder users to their site with the rules. Those who were not interested in this content could swipe left, exactly like what they usually do on Tinder. Those who wanted to participate could go directly to the web page to upload their video. Bud Light achieved its goal: reach and engage its younger target audience who are constantly using their smartphones, thus increasing brand awareness. Among the tens of thousands of participants in the contest, over 1,000 were rewarded with an invitation to attend the weekend party. If you choose to promote a mobile campaign on a specific channel, study its dynamics and create messages in the predominant format. Only then will the promotional content be able to interest and engage users. Which formats are more effective in general? 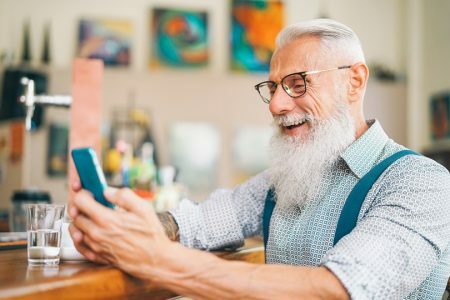 As demonstrated also in this case study, video is definitely one of the formats that creates more engagement on social and must definitely be included in your mobile strategy.